SAN ANTONIO, Dec. 18, 2017 /PRNewswire-USNewswire/ As 2018 makes its debut, the city of San Antonio is gearing up for its biggest celebration yetits 300th anniversary. From unique art exhibitions, culinary events, and festivals to family fun at theme parks and exciting openings, 2018 will be a can't-miss year for the Alamo City. San Antonio has received a number of recognitions and accolades, including being selected as one of the "50 Best Places to Travel in 2018" by Travel + Leisure and being named to National Geographic Traveler's "2018 Best of the World" list,its annual lineup of the 21 must-see destinations to visit in the year ahead. Additional recognitions include Fodor's "Go List" for 2018, as well as both Conde Nast Traveler and Frommer's naming the city a must-visit destination. San Antonio Cocktail Conference 2018 (January 10 - 14): San Antonio Cocktail Conference is back for its seventh year with exciting new events and friendly familiar favorites. Guests can look forward to new events like Cocktails Under the Sea on Saturday, January 13 at La Villita Assembly Hall, and the Tasting Suites, now taking place at the beautiful and historic St. Anthony Hotel, also home to Friday night's Waldorf on the Prairie. Boss Bagel and Coffee (August 2017): CIA (Culinary Institute of America) alums Brannon and Christie Soileau opened this specialty bagel shop where bagels are a hybrid of Montreal and New York bagel-making techniquesmaking their own dough, hand-rolling, boiling in honey water, and baking in a Wood Stone brand oven. Range (September 2017): The newest restaurant from Chef Jason Dady is a modern American chophouse showcasing the bounty of the Texas Hill Country. Nonna Osteria (November 2017):The historic Fairmount Hotel debuted its Italian restaurant, Nonna Osteria, in November 2017. The restaurant is led by chef Luca Della Casa and features classic items like pasta bolognese and margherita pizza as well as more progressive dishes like octopus, wild boar and fritters with salt cod. Burgerteca (December 2017):Developed by renowned Chef Johnny Hernandez, Burgerteca is a never-done-before burger concept that offers custom-made burgers with ingredients and flavors distinct to traditional Mexican food. Maverick Whiskey (Spring 2018): This brand new specialty bar will feature spirits handmade in San Antonio with limestone purified aquifer water and aged Texas-made Oak barrels in the tradition of the original Alamo Whiskey from 1836. Located at the corner of the original Maverick Homestead and steps from The Alamo, Maverick Whiskey will be housed in the restored Historic Lockwood Bank Building (1918) and will feature a one-of-a-kind distillery, tasting saloon, and gathering space that honors the Alamo's heroes and the rich history of San Antonio's early settlers. Villa Rica (early 2018): A brand-new restaurant concept from locally renowned Chef Johnny Hernandez that will open soon in San Antonio's Riverwalk Mission Reach. The menu will feature fresh Mexican seafood dishes, including coastal inspired tacos and tostadas, all prepared from non-GMO, stone-ground corn. Latin-inspired cocktails will round out the offerings. Botanica Music and Arts Festival (March 3 - 4):2018 will mark the first of the annual Botnica Music & Arts Festival. Featured musical acts include Major Lazer, Logic, Deftones, Alessia Cara, and many more. More than 40 performers will be showcased at the two-day festival at La Cantera in the Six Flags Fiesta Texas parking lot. NCAA Final Four Weekend (March 31, April 2):The Final Four is returning to San Antonio in 2018 during the city's 300th anniversary celebration, which will include a three-day NCAA March Madness Music Festival that will be held in San Antonio's Hemisfair Park beneath the Tower of the Americas. Past performers at the music festival include Aerosmith, Maroon 5, Pitbull, Bruce Springsteen, The Zac Brown Band, Kenny Chesney, Fergie, and Rihanna. Fiesta (April 19 - 29): April is host to one of the most popular festivals in the Alamo City, when the streets of San Antonio are filled with music, confetti, and fun for Fiesta. Fiesta is one of the nation's premier festivals with an economic impact of more than $340 million for the city. The week-long festival has grown into a celebration of San Antonio's rich and diverse cultures with events, concerts, parades, and more. Maverick Music Festival (April, 2018 dates TBA):San Antonio's only locally-grown music festival,Maverick Music Festival, will be returning for its sixth year in 2018. Past performances include Bastille, Carla Morrison, The Naked and Famous, De La Soul, and more. Tricentennial Commemorative Week (May 1 - 6):The joy and pride of San Antonio will vividly come to life during the Tricentennial Commemorative Week. Six solid days will be filled with educational, artistic, and entertaining events that showcase the collective essence of San Antonio. Mala Luna (October, 2018 date TBA):Mala Luna music festival will expand to its third year in 2018. The two-day hip hop and electronic dance music (EDM) festival combines national headlining music performers with homegrown musicians, artists, and merchants for an exciting cultural experience. Luminaria Contemporary Arts Festival (November, 2018 dates TBA):A free, two-day art, music, and performance festival, Luminaria brings together an inspiring mix of local and international talent of multiple art disciplines to exemplify San Antonio's more than 300-year history of a being a crossroads between diverse cultures. Viva Hemisfair! (April 6 - 8):A three-phase renovation project will enhance the downtown San Antonio experience by bringing additional open park space, activities, restaurants, and more to Hemisfair Park, the home of the 1968 World's Fair. The Viva Hemisfair event on April 6-8, 2018, will mark 50 years to the date since the grand opening of the 1968 World's Fair. For three days, the district will be filled with cultural zones, music performances, public art, historical exhibits, and throwbacks to the 1968 Fair. For more information, visit www.hemisfair.org. Witte Museum Transformation (March 2017 - Now Open):The Witte Museum recently debuted its once-in-a-century transformation, bringing more than 170-thousand square feet of renovated and expanded exhibition space to the banks of the San Antonio River. Botanical Garden Major Expansion (October 2017 - Now Open):The 33-acre San Antonio Botanical Garden has added eight acres that will bring dramatic new opportunities for guests to explore and connect with nature and discover the value of plants, water, freshly grown food, and the outdoors. Major additions include a discovery complex, culinary garden and outdoor kitchen, family adventure garden, and more. San Antonio Museum of Art (February 16 May 13, 2018): In 2018, the San Antonio Museum of Art will present San Antonio 1718: Art from Viceregal Mexico, which tells the story of the city's first century through more than one hundred landscapes, portraits, narrative paintings, sculptures, and devotional and decorative objects. The DoSeum: Set on a 5.5-acre site on Broadway Street in the city's Broadway Reach district, The DoSeum is a fun and fascinating place where kids can create, make, build, invent, discover, think, dream, and do. Morgan's Inspiration Island: On June 2017, San Antonio welcomed Morgan's Inspiration Island, the world's first ultra-accessible splash park where guests of all ages and abilities can get wet and have fun together. Located next to Morgan's Wonderland in what once was a rock quarry, Morgan's Inspiration Island features five major tropically-themed splash pads, the River Boat Adventure ride and support facilities such as the Wheelchair Valet, where guests can transfer out of their battery-powered wheelchairs into waterproof wheelchairs for maximum aquatic fun.In October, the park was honored with the Leading Edge Award from the World Waterpark Association (WWA). New Attractions and Events at SeaWorld & Aquatica:A Sesame Street parade, a waterslide, a summer celebration, and a beer festival are among the new experiences coming to SeaWorld and Aquatica San Antonio in 2018. SeaWorld will also expand its existing event offerings, packing in more dates and a lot more fun for 2018, including a Wild Days celebration, the Seven Seas Food & Wine Festival, Howl-O-Scream, Christmas Celebration, and more. Sea Life Aquarium & LEGOLAND Discovery Center: Two premier family attractions, SEA LIFE Aquarium and LEGOLAND Discovery Center, are scheduled to open in the Shops at Rivercenter in 2018. SEA LIFE is the world's biggest aquarium brand and highlights spectacular displays of diverse marine life. LEGOLAND Discovery Center will be the ultimate indoor LEGO playground and will offer a range of themed LEGO play areas, creative workshops with LEGO Master Model Builders, exciting LEGO-themed rides, party rooms for birthdays and other celebrations, as well as the popular MINILAND exhibit which will reflect the buildings and skyline of San Antonio. Six Flags Fiesta Texas:The world's first single-rail coaster will premiere at Six Flags Fiesta Texas in 2018 as the park completes its DC Super Hero Trilogy of Rides with the first-ever Wonder Woman-themed coaster. To book hotel and vacation packages or for additional information on events in San Antonio throughout 2018, go to VisitSanAntonio.com/300. Visit San Antonio is a 501(c)6, and serves as the sales and marketing arm of San Antonio as a leading leisure and meetings destination. 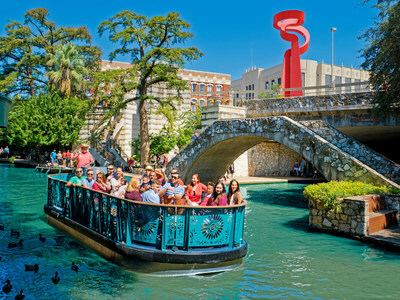 San Antonio welcomes 20.9 million overnight leisure visitors annually. Hospitality is one of the top five industries in the city, contributing $13.6 billion into the local economy and employing more than 130,000. More information about Visit San Antonio can be found at visitsanantonio.com.